ONE OF THE MOST HORRIBLE CONSEQUENCES OF SUBURBAN SPRAWL, beyond the obscene commercial eye pollution, the devastation of open space, and the friendless isolation, is the absolute soulless-ness of the places we inhabit. The nowheres that we live in are everywhere. Wherever you go, there you are. Move three miles and the cycle has repeated. Same Shell stations, same Wal-Marts, same banal patterns. The title of a classic book on the passing of the star era of Hollywood could also be the story of the end of the great American house: They Had Faces Then. I believe that the best old houses possess no less a living spirit than the people who live inside them. As a photographer, I seek out mish-mosh neighborhoods, residential blocks that organically grew over decades without a “master plan” or overseeing developer. Phoenix, Arizona is singular because, within its limits, there are, God knows, endless acres of some of the most self-effacing herdblocks created by the errant hand of man, but also some of the best pre-WWII neighborhoods, divine zones where houses were allowed to sprout, erupt, and just happen regardless of architectural period, style, or standard. It is the wild west realized in stucco. When I find these clutches of houses, I don’t just shoot them, I idealize them, bathing the skies above them in azure Kodachrome warmth, amping up the earth tones of their exteriors, emphasizing their charming symmetries. 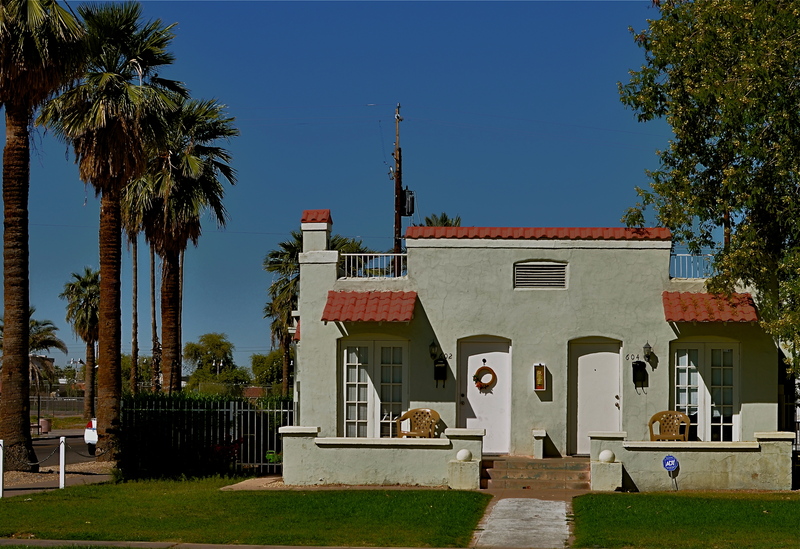 Out here in the Easy-Bake oven of the desert, that usually means a little post-production tweaking with contrasts and colors, but I work to keep the homes looking as little like fantasies and as much like objects of desire as I can. One great tool I have found for this is Photmatix, the HDR software program. However, instead of taking multiple exposures and blending them into an HDR, I take one fairly balanced exposure, dupe it, darken one frame, lighten the other, and process the final in the Tone Compression program. It gives you an image that is somewhat better than reality, but without the Game of Thrones fantasy overkill of HDR. Photography is partly about finding something to shoot, and partly about finding the best way to render what you saw (or what you visualized). And sometimes it’s all about revealing faces. This entry was posted on March 23, 2014 by Michael Perkins. It was filed under 35mm, Architecture, Arizona, Houses, Tonal range, Urban, Viewpoint and was tagged with Architecture, Arizona, color balance, processing, tone compression.